Economy has developed a line of process air heaters that offer performance and versatility in medium to low temperature applications. 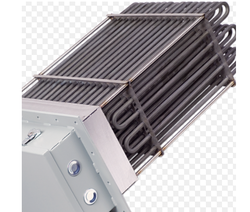 This rugged and reliable line of industrial heaters efficiently conducts heat. Made available to clients, at a market leading rate, the offered Air Heaters are known to be amongst the finest that are available in the market. Manufacturing of this range, done as per the set industry norms and guidelines, utilizing the finest raw materials and modern machines, its standard of quality never deteriorates. In addition, it is known to have a superior performance a longer service life.